A “ground-breaking” two-year scheme to combat gender-based violence is being piloted at Hackney Community College (HCC). 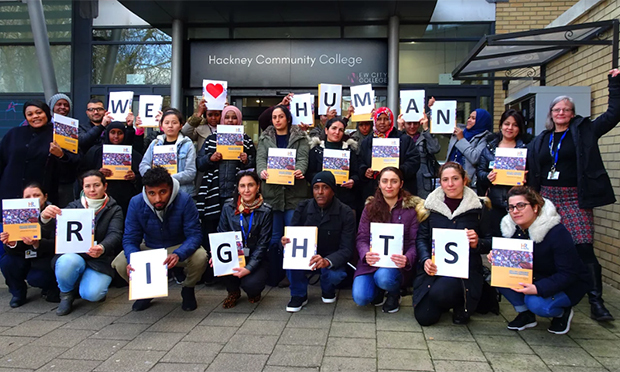 ‘Human Rights in Practice’, run by the Iranian and Kurdish Women’s Rights Organisation (IKWRO), is aimed at newly arrived migrants learning English. The project hopes to tackle issues such as female genital mutilation (FGM), honour crimes and forced marriage by teaching students about human rights alongside their language courses. Nazira Mehmari, service manager at IKWRO, said: “We’re really excited to have brought this pioneering project to Hackney. “It’s so important that everyone living here understands their human rights and how to support each other. The charity says 80 students have already benefitted from the project, backed by the European Commission’s Daphne programme which provides resources and support to organisations fighting for the protection of women and children. IKWRO was founded in 2002 to represent women and girls from Middle Eastern, North African and Afghan communities at risk of gender-based violence. It opened its first specialist refuge in 2015, and last year provided support to over 3,000 women and girls.